Walking with Jesus: Day 35: Matthew 14:22-36 & Psalm 35 - What Do We Do When Jesus Sends Us into the Storm? Day 35: Matthew 14:22-36 & Psalm 35 - What Do We Do When Jesus Sends Us into the Storm? What Do We Do When Jesus Sends Us into the Storm? It's impossible to miss the truth of what happens to the disciples in today's reading: Jesus deliberately sends them far away from Himself and into the path of a fierce storm. He send them into the storm alone while He goes up on a mountain alone to pray. On the surface, this makes no sense. The disciples must have been wondering from the start: Why is Jesus sending us into the boat by ourselves? Why isn't He coming with us? Where is he going? What is he doing? Once the storm began and intensified and the night went on and on, they must have really questioned: Why are we here? Where is Jesus when we really need Him? Doesn't He care about us? Did He make a mistake? Have you struggled with some of those same questions and doubts? What do we do when Jesus sends us into the storm by ourselves? What do we do when the pressures and conflicts of life seem too intense to bear and Jesus seems so far away? 1. Obey Jesus, even when His commands don't make sense. 2. Wait patiently for Jesus, even when He seems far away and you wonder how He's going to show up. 3. Keep at the task Jesus has assigned you to do, even when it's hard and you don't seem to be having any success. 4. When Jesus comes to the rescue - as He always does, one way or another - have faith and worship Him! 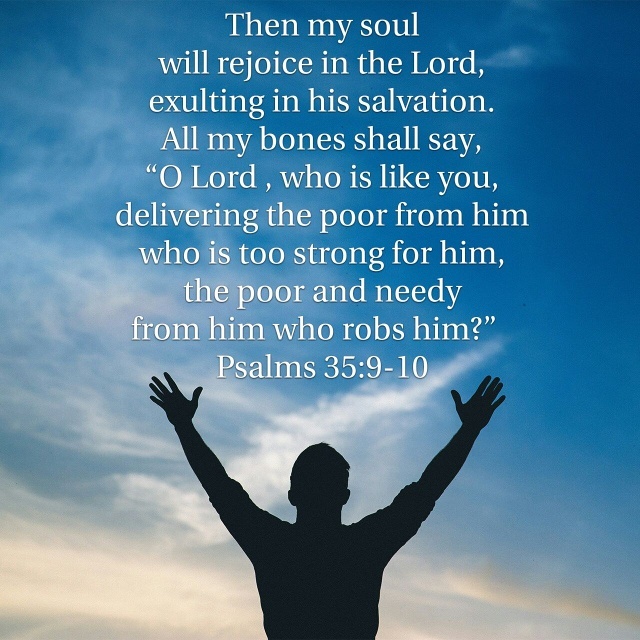 Psalm 35 is an urgent and passionate prayer for deliverance from enemies. We can read this as one of the prayers of deliverance from Jesus during His earthly life, in keeping with Hebrews 5:7: "In the days of his flesh, Jesus offered up prayers and supplications, with loud cries and tears, to him who was able to save him from death, and he was heard because of his reverence." We can also pray it in urgency for deliverance from our enemies who press in hard against us and seek our destruction. Your Son suffered more agony, grief, sorrow and temptation than any other human being who ever lived, much more than I could ever imagine. During the days of His life and during the times of His intense suffering, He cried to You and prayed to You - in the desert wilderness, in the Garden of Gethsemane, on the cross - and You faithfully heard Him and answered Him and delivered Him. The resurrection and ascension of Jesus show me You love and power of deliverance. Father, I am surrounded by enemies and my own sinful nature wages war against me. My sinful desires, the opposition of the world, the devil who tempts and torments - all of these fierce and determined enemies oppose me, attack me, and threaten me. They do so because they hate You, my righteousness, and they hate Your kingdom and power and glory and worship. They want to see me fall and be destroyed as a way to dishonor You and discourage Your people. Lord, hear my cry and hear the cries of all of Your people who suffer attack daily. You have seen, O Lord; be not silent! O Lord, be not far from me! and let them not rejoice over me! For when You answer me, Lord, and when You bring me deliverance, I will praise You and give thanks to You and for You. I thank You that You always answer according to Your wisdom and love. In Jesus' name, Amen.